Montague Conny, Germany (Region Europe) - bpw-leadershiplifelonglearnings Webseite! Conny runs her own training organization and specializes in developing and marketing intercultural and other business seminars, as well as giving these seminars as a senor trainer. She manages free-lance training staff and runs Train-the-Trainer seminars. She works as an examiner for the Munich Chamber of Industry and Commerce. Her clients are large and medium-sized companies with a strong international focus from the sectors of automotive, production and finance, both in Germany and abroad. 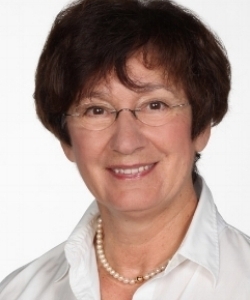 She is also a lecturer at the Aalen University for Applied Science where she teaches management and presentation skills to various MBA and MSc courses. Conny is one of the founding members of her BPW Club in Burghausen and was the Club President for six years. She is a certified PEP Trainer (by BPW/USA in New York) and runs Train-the-Trainer courses for PEP trainers in Europe. Apart from organizing workshops for the team members and giving lectures she is also an author of the BPW Leadership Training for Women.